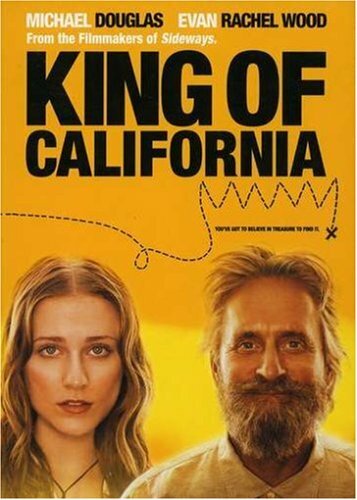 BCDB Rating: "King Of California" has not yet received enough votes to be rated. This page has been viewed 21 times this month, and 827 times total. Cartoon Characters: Charlie, Miranda, Pepper, Rita, Doug, Kelly, Applebee's Manager, McDonald's Manager, McDonald's Customer, Boy, Officer Contreras, Security Guard, Greeter, Joseph, Teacher, Bruce, Leonid, Sheriff's Deputy, Firefighter, Older Cop, Younger Cop, Costco Employee, Chinese Man, Cop at Excavation, Costco Shopper, Fast Food Patron, Security Guard Mike, Chinese Refugees, Swingers. After getting out of a mental institution, an unstable dad tries to convince his daughter that there's Spanish gold buried somewhere under suburbia. Do you have anything to add to this page? Have we made any mistakes... or do you have any additional information about King Of California? If so, we would love to hear from you. Please send us a quick note with your additions or corrections to this page, and we will make the corrections as soon as possible! Do you love King Of California, or do you think it is the worst cartoon ever? Let us know what you think! Surely you have an opinion... so share what you think. Take a minute and post your own comments about this cartoon here. King Of California by Big Cartoon DataBase is licensed under a Creative Commons Attribution-NonCommercial-ShareAlike 4.0 International License.